Image caption Bob Higgins is no longer with Fleet Town FC and had worked on an "informal unpaid basis"
An ex-Southampton youth coach accused of abusing boys in the 1980s was not police checked for a later football coaching job, the BBC understands. 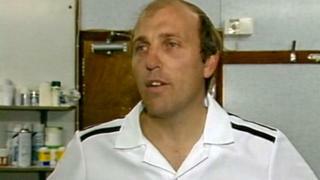 Bob Higgins, who had been a coach with Fleet Town Football Club, was cleared of sexual abuse charges in 1992. Fleet Town FC said Mr Higgins was not police checked in 2012 as his role did not involve working with children. On Sunday, Fleet Town said he was no longer involved with the club and had worked on an "informal unpaid basis". A statement from club chairman Steve Cantle said: "His involvement was limited to assisting the coaching team with the adult first-team squad of players." He said the club had received no notification from either the Football Association or the police about allegations made about anyone involved at the club but would co-operate fully in any investigation. Earlier, Fleet Town FC told the BBC that their welfare officer did not check Mr Higgins' criminal record at the time he joined the club as his role did not involve working with children. The BBC has made attempts to contact Mr Higgins for comment. Former Southampton youth player Dean Radford, who alleges he was abused by Mr Higgins, told the BBC: "It's just unbelievable that he is allowed to carry on his life as normal, and that nothing has been put in place to make sure he is not allowed to work in football. "The letter was sent out, but no one followed it up, to check that he wasn't still working with clubs. "Everybody that works with clubs should be checked. Because if there is even 1% of doubt about someone, then they should not be allowed to be coaching." Former Southampton players have described Bob Higgins to me as a "kingmaker". A career in professional football was their dream and winning his approval was key. Former youth team players tell me in the 80s everybody looked up to him. Aside from the physical abuse that former players allege took place, players claim Mr Higgins had a strong mental "hold" over young boys. One player told me he resisted an alleged attempt by Mr Higgins to abuse him, and found himself suddenly dropped from training. At Fleet Town Football Club, where until recently Mr Higgins had been involved with the adult first team, he was described to me as a "high-calibre" coach. Rumours, however, about Mr Higgins' behaviour have circulated widely in the football community for some time. Mr Higgins always denied any wrongdoing. Some dismissed the rumours as "banter". Now players who have come forward with serious allegations are demanding this is investigated properly. According to the Football Association's policy, anyone working with children and young people in football must complete Enhanced CRC (Criminal Record Checks), formerly known as CRB (Criminal Records Bureau Check), with the Children's Barred List Check. CRCs are not currently required where under 18s play within what the FA calls "open-age football". An Enhanced CRC would have flagged up Mr Higgins' previous charges and the acquittal, plus the worries police and social services had expressed about him in 1997. Fleet Town said it did not carry out such a check on Mr Higgins because he did not have unsupervised access to young players. Meanwhile, former footballers Andy Woodward, 43, Steve Walters and Chris Unsworth, both 44, have launched the Offside Trust to support players who are victims of abuse, and their families. The former players broke their silence last month to make claims of abuse in football, prompting several more to come forward. A total of 350 people have alleged they were victims and 55 football clubs are linked to allegations of abuse. Some 18 police forces have announced investigations into claims of sexual abuse in football. Earlier on Sunday, FA head of equality and safeguarding Sue Ravenlaw told BBC Radio 5 live that the scale of the abuse allegations was the biggest challenge for the FA, alongside reassuring young people that football is safer today. Pointing to the safeguarding regulations that have been put in place over the past 10 to 15 years, she said: "I would like to think the culture has changed." However, she said the scale of the abuse allegations was a "massive wake-up call" for club owners and directors to do the right thing at every level. She said: "I'd like to think that we're doing the right thing, and others will follow our lead. This is a time for transparency and openness and for us to get things right for children".